Tiny footprint relays feature very fast operate and release times making them ideal for high speed test systems. Pickering Electronics are pleased to announce that the new Series 124 4mm range of ultra-high-density reed relays are now available. These new relays are the lowest profile reed relay on the 4 x 4mm footprint, measuring just 9.5mm high. Devices are currently available in 1 Form A (energize to make) with options of 3 or 5 volt coils. 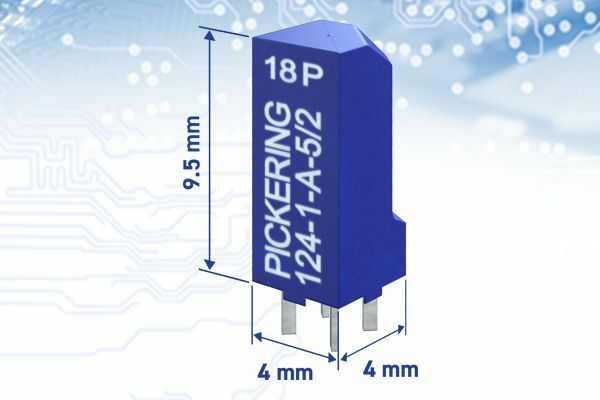 These single pole relays are the second series to be launched within Pickering’s new ultra-high density 4mm product line – Series 120 devices were released at Semicon West last year, rated up to a 1.0 Amp at 20 Watts, but with a higher profile height of 15.5mm. The device has pins on a 2mm square pitch. There are suitable connectors available from some manufacturers, both SMD and Through Hole, that will allow these relays to be stacked in either a row or in a matrix on a 4mm pitch.